Abstract: The GeForce 7950GX2 is nVIDIA's flagship graphics card du jour, and the first true dual core, dual slot PCI Express videocard from the boys in Santa Carla. Here's a quick question, how do you make an already exciting videocard even more interesting? Allow more than two GPUs to run together for even more 3D performance duh! ATi has already talked about how its Radeon cores can scale past two cores, but it's nVIDIA first out of the gate with the product. For the conspiracy theorists, this might also be a sign of what lays ahead in videocards. In the last few generations we have seen an increase of power usage and heat (avg 80W per core) for high end GPUs. Perhaps all this fuss about multi-videocard rendering is due to both companies trying to convince the masses that parallel rendering is good. Necessary even. The GeForce 7950GX2 is nVIDIA's flagship graphics card du jour, and the first true dual core, dual slot PCI Express videocard from the boys in Santa Carla. While there have been a handful of single card dual GPU videocards introduced, these have all been brand specific attempts (like the Gigabyte GV-3D1 dual 6600GT and GV-3D1-68GT dual 6800GT). The GeForce 7950GX2 brings SLI power to every PCI Express platform! For SLI compatible motherboards (and anyone with really deep pockets), it's possible to run two GeForce 7950GX2 videocards together in SLU for a total of four GPUs rendering simultaneously! That's just ridiculously sweet! In this review PCSTATS has the pleasure of testing out a MSI NX7950GX2-T2D1GE videocard - and from the outset this is one impressive bit of circuitry. As videocards go, the GeForce 7950GX2 aren't one to be messed with by the looks of it. Quick Installation Guide, Quick User's Guide, Driver CD, King Kong CDs, S-Video Cable, Component Output Cable, 2x DVI to analog converters, dual molex to 6 pin power connector. The MSI NX7950GX2-T2D1GE videocard is based on the nVidia reference design, which is a combination of two separate videocard PCBs which have been stacked together to form a two-slot device. There are two GeForce 7950GX2 GPUs, each with 512MB of memory for a total of 1GB dedicated to all things graphical rendering. The card is HDCP ready and Microsoft Windows Vista compliant. The DVI video outputs will support a DVI-to-HDMI cable if you happen to have one (not included), and want to output a high quality image at 1080p to your HDTV. MSI's NX7950GX2-T2D1GE slips delicately into a single PCI Express x16 slot, but occupies two case bracket spaces. It has one TV-output connector and two DVI connectors, analog to digital adaptors are included. The card supports component output and S-Video output. All nVidia Geforce 7950GX2's can be run on any motherboard with at least one PCI Express x16 slot, even if the board's chipset does not officially support SLI. With a retail price of $640 CDN ($567 US, £303GBP) the MSI NX7950GX2-T2D1GE is the definition of high end gaming hardware! The MSI NX7950GX2-T2D1GE is an awesome videocard to look at and it's quite long at 23 cm. The dual PCB videocard takes up two expansion spaces and gets very hot during operation; good case cooling is a definite must. 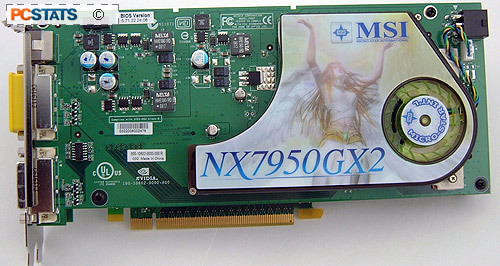 The NX7950GX2-T2D1GE requires an extra power connector in the form of a six pin 12V plug at the rear of the card. As with all Geforce 7950GX2's, the card is SLI compatible with an identical unit. 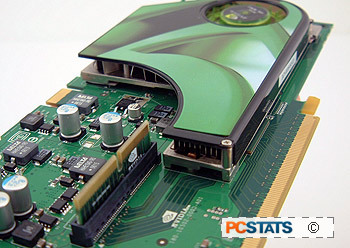 The SLI connector on the top videocard is placed near the middle of the PCB to prevent any unfortunate mix ups with other units from the same Geforce family. 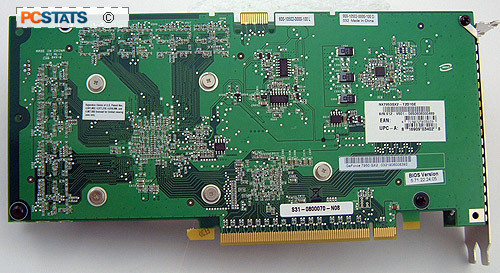 This deters people from trying to connect a GeForce 7900GTX videocard to the GeForce 7950GX2 for example. nVIDIA uses TSMC's 90nm manufacturing process to build the GeForce 7950GX2 GPU, and each core contains staggering 278 million transistors. As you may have guessed, the Geforce 7950GX2 specs are exactly the same as those for the GeForce 7900 series GPU. The GeForce 7950GX2 GPU has the same features; 24 pixel rendering pipelines, 8 vertex pipelines, 256bit memory controller, etc., however the core and memory clock speeds are set slightly lower. The GeForce 7950GX2's two GPUs come clocked at 500 MHz each; comparatively we find speeds of 700 MHz for the Geforce 7900GTX, 470 MHz for Geforce 7900GT. The GDDR3 memory runs at a cool 600 MHz, were as it is 800 MHz for the Geforce 7900GTX and 660 MHz for the Geforce 7900GT. All the usual nVidia technologies are represented of course, including; CineFX 4.0 engine support, Intellisample 4.0, OpenGL 2.0 and DirectX 9.0c. Of course considering the nVIDIA GeForce 7950GX2 is running in SLI by default, those values are essentially double. Doesn't 48 pixel and 16 vertex rendering pipelines sound sweet? How about 76.8GB/s worth of bandwidth? Pg 5. Overclocking one fast videocard! Pg 16. The Start of a Revolution?